Markieff Morris (6'10''-F-89, college: Kansas) couldn't believe the Blazers kept leaving him open. 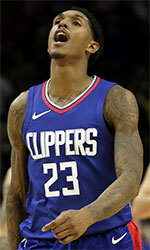 Morris had 28 points, including a career-high six 3-pointers, and the Washington Wizards won their first game of the season with a 125--124 overtime victory over the Portland Trail Blazers on Monday night. "After the second (3-pointer) I was like, 'Are they really gonna let me shoot the ball?' I think that's the most I ever shot," Morris said. "I was playing (Jusuf) Nurkic and he couldn't cover the pick and roll and the three so they just had to give something up." Bradley Beal added 25 points for the Wizards, and Otto Porter (6'8''-F-93, college: Georgetown) Jr. blocked Damian Lillard (6'3''-PG-90, college: Weber St.)'s layup attempt at the final buzzer to seal the win. There were 29 lead changes and 23 ties. Lillard had 29 points, eight rebounds and eight assists for the Trail Blazers, who lost their first game after opening the season 2--0. Morris had a layup and a free throw to put the Wizards ahead 120--117 in overtime. Lillard's layup got Portland closer, but Morris landed a 3--pointer with 38.5 seconds left. Lillard's jumper got Portland within a basket before John Wall (6'4''-PG-90, college: Kentucky)'s 17--footer with 10.1 second left looked to all but seal it for the Wizards. CJ McCollum made it interesting with a 3--pointer for the Blazers and Wall missed a pair of free throws, but Porter blocked Lillard's attempt to win it with a layup at the buzzer. "The kind of effort we had, we put ourselves in position to win the game," Lillard said. "We just didn't execute, on the defensive end or the offensive end, as good as we needed to to win it. That's frustrating." Nurkic finished with 22 points and 18 rebounds for the Blazers. The game was close throughout the second half. Portland led 102-97 with 3:08 left but the Wizards pulled in front 105-103 on Morris' 3-pointer. Lillard's 3-pointer tied it again at 108 with 52.2 second left. Nik Stauskas hit a 3-pointer to put Portland ahead with 13 seconds left. But Beal made a 3 for the Wizards with 7.4 seconds to go to tie it again and the game went to overtime. Blazers coach Terry Stotts praised Morris. "That was a tough matchup with guarding the pick and roll with him. We brought Moe (Harkless) in and they went down to the post. He had a terrific game, inside and out." It was the first of a five-game road trip for the Wizards, who lost two at home to open the season, including a 117-113 loss to Toronto on Saturday night. Beal scored 32 points and became the career leader in 3-pointers in the loss and coach Scott Brooks was ejected on a technical. Washington continues to await the season debut of Dwight Howard (6'11''-C-85), who missed all of training camp with gluteal soreness. Ian Mahinmi (6'11''-F/C-86) started at center for the third straight game, but left in the first quarter with back spasms and did not return. The Blazers started Jake Layman at forward for the third straight game while Maurice Harkless (6'8''-G/F-93, college: St.John's) continues to return to form after a knee injury. Harkless' minutes are restricted. Portland was coming off a 121-108 victory over the San Antonio Spurs on Saturday. Following Monday night's game the Blazers embark on a four--game road trip, their first of the season. Portland led 32--28 after the opening quarter and led by as many as 10 points, but the Wizards climbed back into it, pulling in front 47-46 on Beal's 3-pointer. The teams traded leads and went into halftime tied at 62. Beal led all players with 19 first--half points while Portland's McCollum struggled, going 1-of-11 from the field. After trailing most of the third quarter, Portland pulled back in front on Evan Turner's short jumper from out front that made it 75-74. But it was short-lived and the Wizards led 78-77 heading into the final quarter.